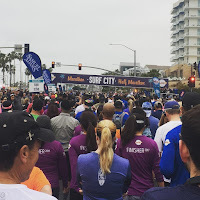 In January, I decided to add the Surf City Half Marathon in early February to my schedule. 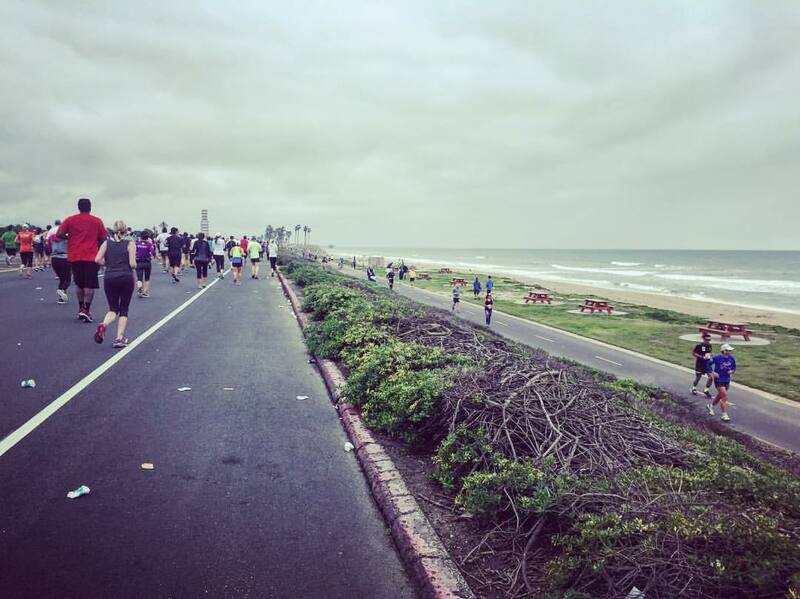 Why add a half marathon to my schedule all the way across the country? Well, to put things simply... there was an extra medal in it for me, lol. The Surf City Marathon partnered with the San Francisco Marathon and offered a special medal for runners who've done distance races at both events - the "California Dreamin'" medal, a really pretty spinner medal shaped as the State of California. So the plan was put into place... I would only spend 48 hours in Los Angeles! I flew out Friday night, arriving in a very foggy Los Angeles around 10pm. After picking up my rental car from the Hertz at the airport, I drive up the 405 to the "Valley," and stay the night with my friend Pretty and her husband Matthew in Sherman Oaks. Mind you, by this time it's now around 11pm, but feeling more like 2am for me. I fade fast and head straight to bed. 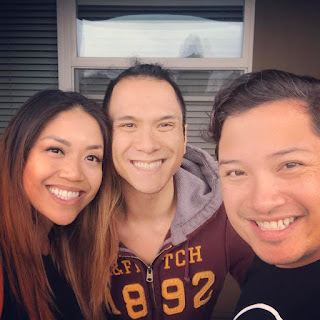 So I head back toward Sherman Oaks, and meet with up with my Broadway Barkada friend Isabelle, who recently relocated with her boyfriend out to the west coast. I have a second breakfast with her, a massive and delicious French toast dish with bacon, at Sweet Butter Kitchen, off of Ventura Boulevard. By then it was getting close to noon, so after dropping her off near her apartment in Universal City, I headed down to Huntington Beach, a 1 1/2 hour drive encountering a bit of traffic along the way (totally not surprising)... my first taste of LA traffic during this trip. The expo was outside on a parking lot right next to Huntington Beach, located in large tents. Picking up my bib was pretty seamless, and there were several vendors around selling their wares, including a few folks promoting their races. I stuck around at the expo for a little while, seeing several friends (including Marie and Lisa from Washington) and waited around for my Black Sheep friends Adrian and Almi, and Almi's son Nate as they came down to the expo. We even got some time to enjoy the bands playing out in the food truck food court set up at the end of the expo. The four of us headed out to get a late lunch nearby, some great Japanese food before driving back to Almi's place where I would sleep for the night. 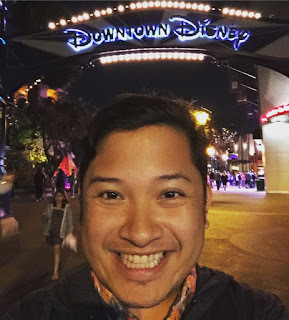 We drove separately back to her house in Cerritos to drop my car off and bring my bags inside, then relaxed for a bit before heading out again with them, this time to Downtown Disney in Anaheim. I thought about the last time I went to Disneyland, even though technically this wasn't Disneyland itself... this shopping, dining, and entertainment complex is located off the grounds of the theme park, and was opened in 2001. The last time I visited the park though... was 28 years ago, when I was 5! After walking around a bit and eating more (OMG, the beignets! ), we headed to Rainforest Cafe for dinner. To eat again. After a little while of waiting, we sat upstairs, and ended up having some really poor service from the waitstaff... but we were at least entertained by our surroundings - primarily from the animatronic gorilla randomly making noises during dinner, and positioned right next to our table. 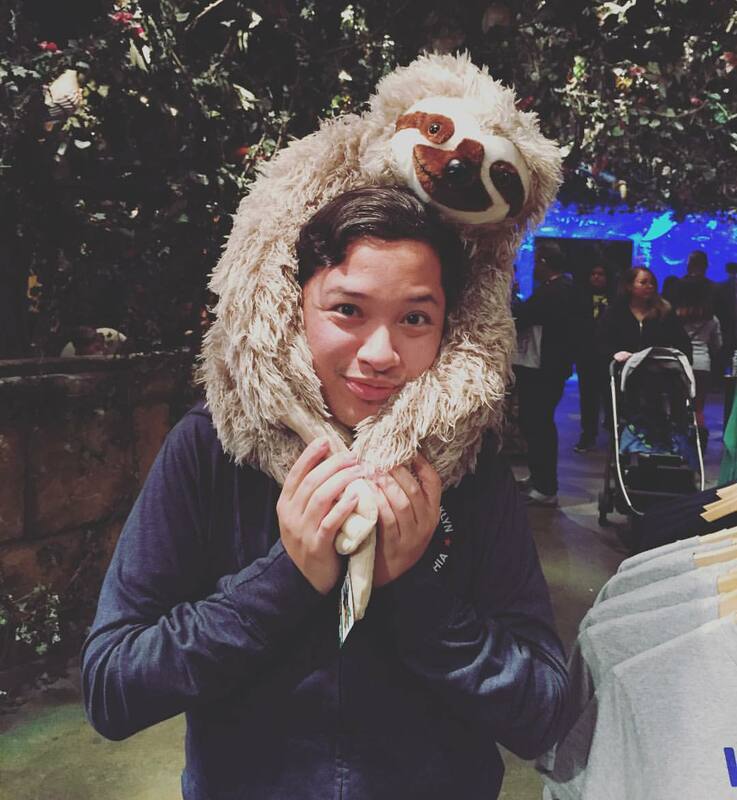 First time at Downtown Disney! After dinner, we headed back to Cerritos to turn in, as we had an early morning 5am wake up call, with a plan in place to leave by 5:30am. On our way to Huntington Beach, we dropped off Almi's son with her sister in Garden Grove. We were running a little late, but still managed to get to the beach with lots of time. 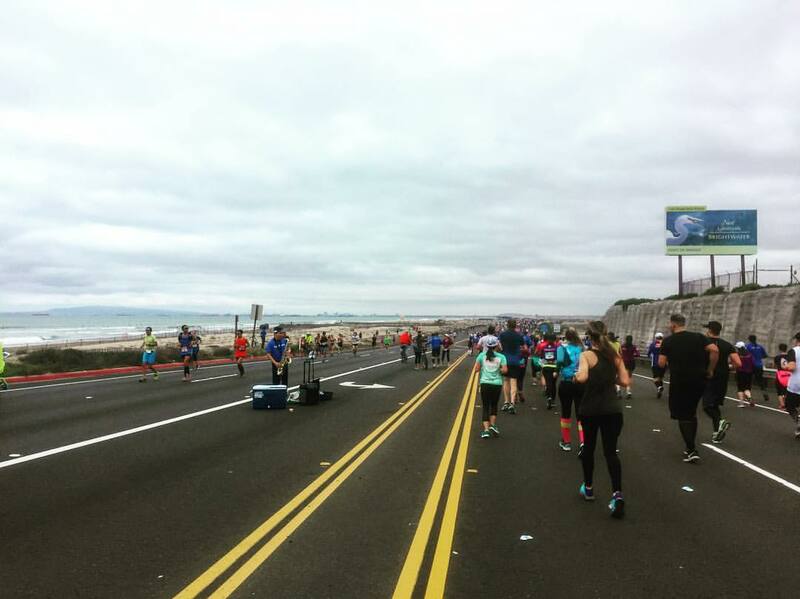 We parked in a structure on Main Street, seeing the marathoners already running down the Pacific Coast Highway (PCH). We then walked the half mile to the start area - and for California, it was chilly, at 51 degrees - yet totally awesome for me, as it was freezing in NYC. Race kit laid out ready for the morning! 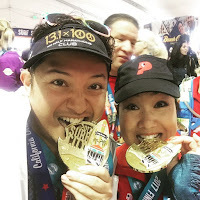 After getting to the start area, I dropped off my bag at the gear check inside the expo tent, then met up with my friend Julie, who was waiting in the lengthy port-a-potty lines with a couple of other Pasadena Pacers friends. 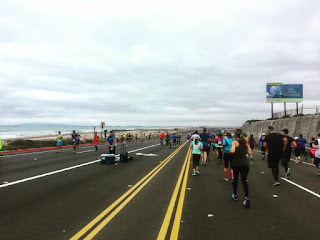 When we were all ready, we headed to the start corrals that took over the entirety of the Pacific Coast Highway, and waited about 15 minutes before we officially crossed the start mats. Huntington Beach showing its surf's up style! 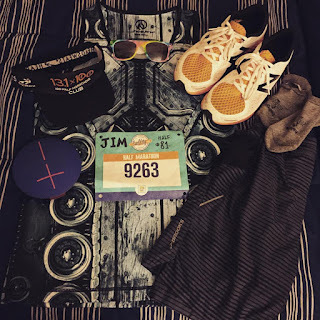 As this was a fun race for me, I wanted to provide some fun for fellow runners, and brought my portable speaker with me. 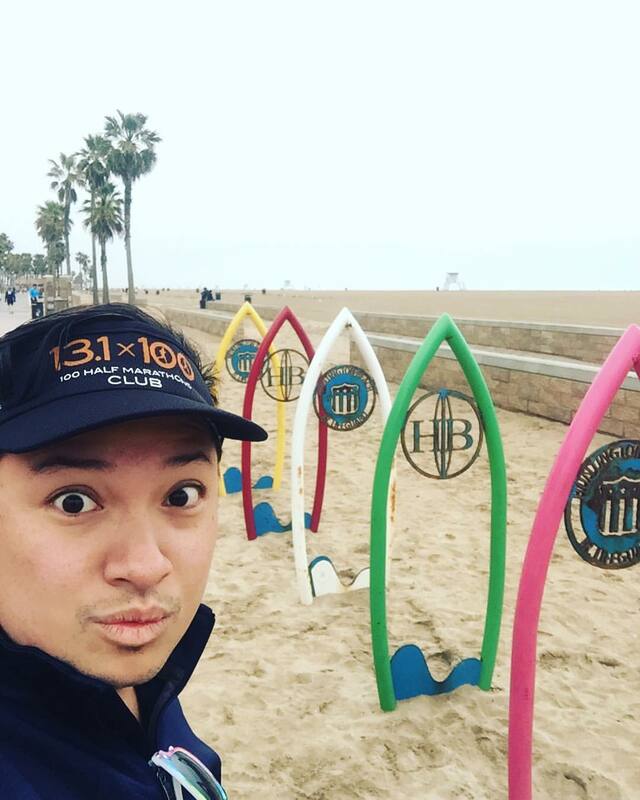 I had a relatively strong first 5K, running along the flat PCH, with "Cake by the Ocean" as my fitting first song blaring on my speaker. 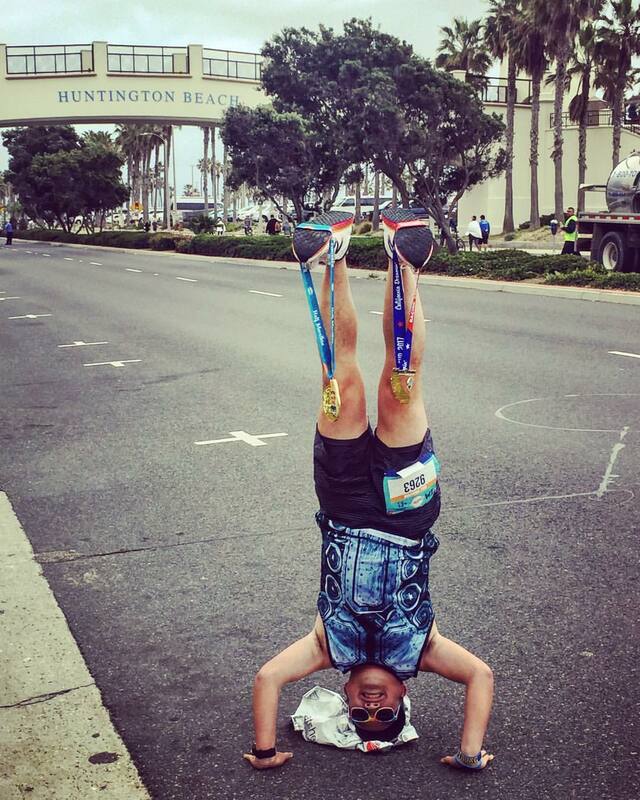 Fellow runners enjoyed the "mobile DJ." 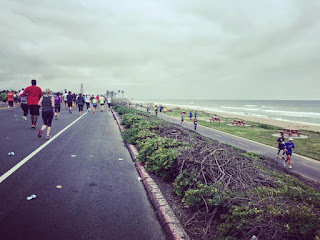 We eventually turned right onto Seapoint Street, and then headed northeastward along this street as we saw the flood of runners heading back on this out-and-back loop. 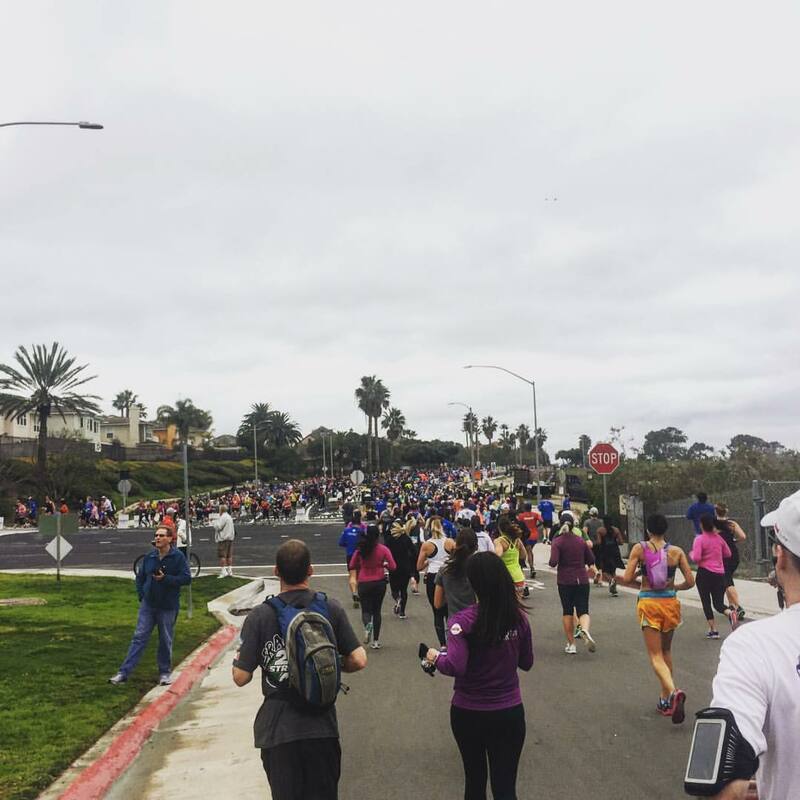 We turned right onto Garfield Avenue, while we saw runners heading down a steep downhill to run back onto Seapoint Street to the PCH. Heading eastward on Garfield Avenue for a short 0.2 miles, we encountered our first real hill of the race. 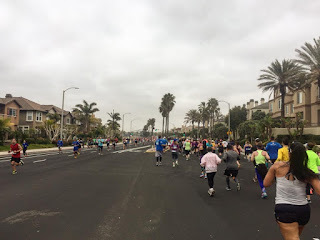 We then turned left onto Edwards Avenue as we reached the highest point of the race at a mere 100 feet in elevation (from a flat 36 feet along the PCH), and ran a city block up to Overlook Drive. We then ran along Overlook Drive, with views of the Bolsa Chica Ecological Reserve and coastal estuary. historically used for oil and natural gas production activities. 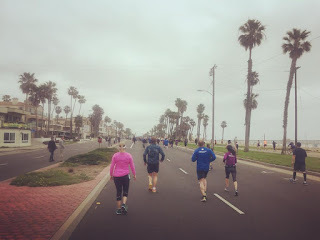 From there, we ran the nice downhill back to Seapoint Street, and then made our way back toward the beach, turning right onto the PCH for another long out-and-back, 2 1/2 miles out and 2 1/2 miles back. It was considerably windier on this leg, but made sense with us being on a spit of land that basically just had the beach and the highway with no tall buildings blocking the way - just the breeze from the Pacific Ocean and Bolsa Bay. 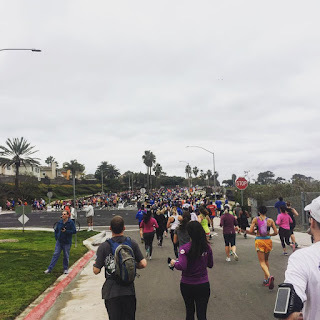 As we ran this out-and-back, we got to see lots of other runners along the way, including both Adrian and Almi, who I saw about five minutes before I reached the turnaround point alongisde Bolsa Chica State Beach. Julie and I with our medals! I hoofed it in the last mile and a half, and managed to finish in a respectable 2:17:26, easily surpassing my two other California half marathons (Rock 'n' Roll San Diego and Rock 'n' Roll San Jose, both in 2015) by nearly fifteen minutes. Shortly after finishing I even spotted a recent friend Mike, who I met a few weeks before in Louisiana - he had a strong showing finishing the full marathon under four hours! 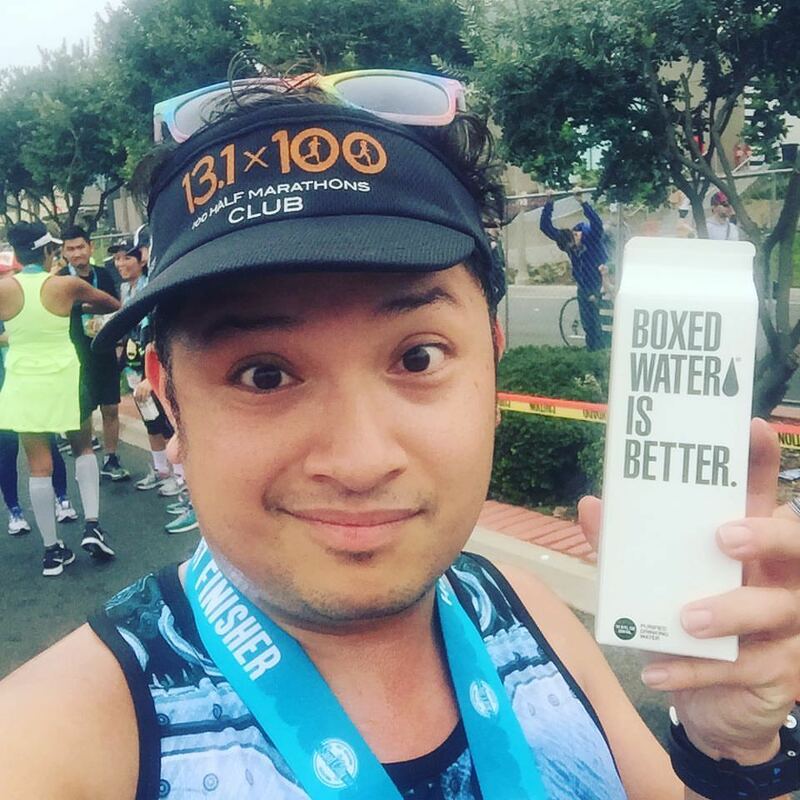 After going through the finish chute (and getting boxed water? 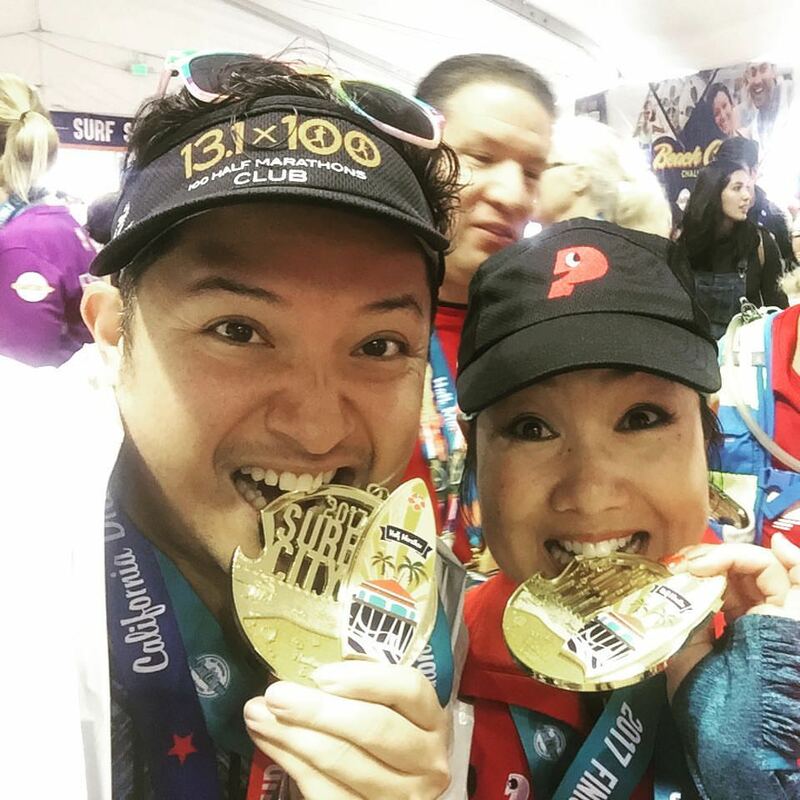 ), I headed over into the race expo tents to retrieve my bag and also pick up my special "California Dreamin' Racing Cup" medal, which I received for completing the 2016 San Francisco Marathon as well. 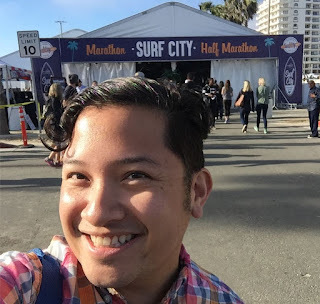 I stuck around and waited for a couple of other friends to finish and to take post race pictures, and then met up with my good friend Allen (recently relocated back to California from NYC). I enlisted his help with taking my headstand photo, heading toward the Hyatt Bridge for its location. Boxed water?! Apparently, that's a thing. With the rest of my day to spend with him because of my redeye flight back to NYC, we headed back to his car and drove off to Irvine to meet up with our other friend Anthea (also another friend recently relocated to California from New York... and also so I could shower at her place), who was prepping for a Superbowl party. After a short visit with her, we headed back to Cerritos for me to pick up MY car, and then popped over for a late lunch at a Vietnamese pho spot in neighboring Artesia - one of the few places that were open for customers not caring much about the Superbowl. We then caravanned over to Allen's house in Carson, where I was able to rest a bit and watch some of the Superbowl, before I headed to the airport to get gas, drop my rental car off, and then grab dinner at one of the airport lounges. Despite having my flight go through Terminal 5, I walked over to terminal 6 to utilize the Alaska Lounge (part of my Priority Pass Select membership) and then headed to my gate at 10 in order to board. Barkada reunited -- Anthea, Lucky, and Jim! I was super tired by the time we were boarding. I pretty much conked out minutes after sitting down, and well before the plane took off; I'm such a good plane sleeper that I didn't wake up again until we were landing in NYC. We made such good time that we even arrived at JFK almost an hour early, so I headed to Wingtips at Terminal 4 in JFK to utilize their lounge and have breakfast... and then headed straight to work, business as usual!